Welsh male voice choirs say they are struggling to attract younger members despite the popularity of groups such as Only Boys Aloud and Only Men Aloud. Many say they are made up mainly of men in their sixties and seventies, with very few singers younger than retirement age. Some say they are worried about the future if the trend cannot be reversed. But one of the founders of Only Boys Aloud said male choirs needed to work at attracting younger members. One choir which has just begun trying to recruit new members is Cor Meibion Maelgwn, which rehearses in Llandudno Junction. Its musical director, Trystan Lewis, said: "When you look at choirs in north Wales or south Wales, the membership is in their sixties, seventies and eighties. So the long term future of male choir singing is very worrying actually. "We're quite fortunate that we've got over 70 members, and we're one of the biggest choirs in Wales. But we're constantly looking ahead, and we are worried about the long term future, not just of this choir, but also of male singing in general. "Even though there's a lot of interest in groups such as Only Men Aloud and Only Boys Aloud, we can't seem to attract that same interest in people joining choirs like ours." Dewi Miles, a member of Cor Meibion Maelgwn, is on a new committee the choir has set up to look at ways to attract new singers. He said: "I think the main reason young people aren't joining is time. When I was younger, I was working as a teacher and I had other interests. But when I gave up work, I had the time." Choirs from Bridgend, Brymbo, Cardiff and Colwyn Bay all said they have experienced similar problems. But Aled Powys Williams, who helped set up the group Only Boys Aloud, said male choirs needed to win younger people over. "When we started, we went round schools, arts centres, various venues across the community and held workshops," he said. "We wanted to show young people that it's not about standing there, wearing a blazer with a folder in front of you and everybody's got white silver hair. "It was about showing the different, arguably more fun elements of what singing's all about. "As a result of Only Boys Aloud, about a dozen members have joined the more traditional male choirs as well." 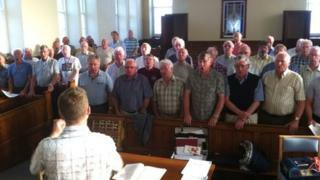 Rob Nicholls is conductor of Cor Meibion Taf in Cardiff, one traditional choir which has managed to attract younger men. About half the members are in their thirties. But he said: "If people are being recruited, and the numbers are good, personally I wouldn't see it was that much of a problem. "These days, with lifestyles being so busy, more often than not, it's only people that are retired that have the time to really commit to a choir." Is the choirboy now endangered?